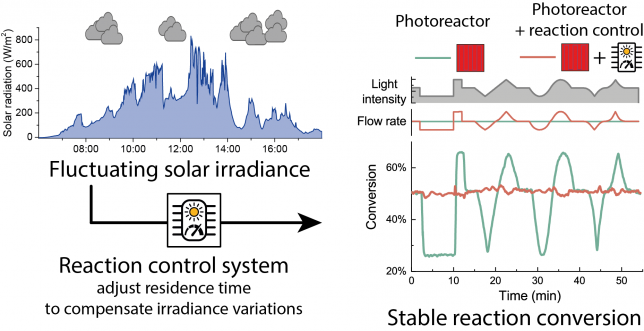 Our latest paper on a real-time reaction control system for the solar production of chemicals under fluctuating irradiance was published online today in Green Chemistry (DOI: 10.1039/c8gc00613j). Our solar-photochemistry research has always been characterized by the desire to reduce the gap between the lab and the rooftop, in other words we want to enable the use of sunlight as a free light source for many photochemical reactions in a simple and efficient way. With the Luminescent Solar Concentrator PhotoMicroreactor (LSC-PM) design we introduced a novel way to convert the polychromatic solar spectrum into a narrow band, while now we addressed the issue of light intensity fluctuations (e.g. due to passing clouds).1 Here, we will give you some inside information on our solution for this important issue within solar photochemistry. To the chemist inclined to perform photochemical reactions with solar light, one of the main limitations is represented by the uncontrollable fluctuations in solar irradiance. In particular, while the daily and seasonal variation can be predicted, short fluctuations introduced by passing clouds are the most difficult to address. In the past, we experienced this first-hand when we tested outdoors our reactions (e.g. see Figure2). Figure 2 Impact of sky conditions on solar reaction performance. To use the words of an anonymous reviewer, “It is common knowledge that the kinetics of photoreactions are often governed by the supplied photon flux.” Using a light sensor for adjusting the irradiation time to compensate the different irradiance might, therefore, seem trivial. Alas, reality is unfortunately far from that! Being aware of the relationship between the light intensity emitted at the device edge and the photon flux in the reaction channel, we had to find a way to measure the former as an estimation for the latter. Thanks to the advancements in electronics, that is not a difficult task. After all, most of our smartphones have a little sensor to adjust the screen backlight to the ambient light conditions. After a brief screening of different light sensors (photoresistors, phototransistor, integrated circuits based on PV cells) we decided to use a phototransistor thanks to its simplicity. By including it in a voltage divider circuit, the variation in the light intensity can be measured as a variation in the voltage drop across a resistor connected in series (see circuit in Figure 4). 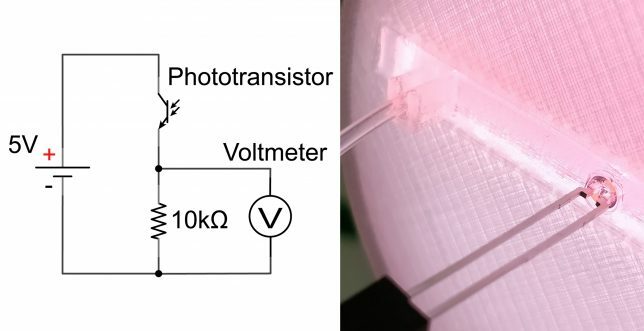 Figure 4 Schematics of the light sensing circuit used (left) and a photo of the phototransistor fixed in a 3D printed holder to keep it on the device edge (right). With a working sensor in our hands, we needed to perform the calibration between the different light intensity levels, and the corresponding conversion at different residence time. This can be a rather laborious work but, as you might have noticed at this point, in our group we are not afraid of merging chemistry and technology. Therefore, we have developed a simple python script to control pump flow rate and LED light intensity (with a MOSFET) while measuring the reaction conversion was measured in line with a UV-VIS spectrometer. As such, this data can be obtained in fast, automated and reliable fashion. After gathering all the required data, finding the voltage/residence time relationship to keep the conversion stable was relatively easy. The first tests of the system with an artificial set of light variation were both encouraging and alarming. While the system was actually capable of adjusting the residence time to match the variation of light intensity, its reactiveness was too slow. For a moment we feared that this might be an intrinsic limitation of our reactor (e.g. due to its elastic nature or modest volume). It turned out that the major source of variability was the delay between the light intensity reading and the adjustment of the pump flow rate. While the phototransistor responsiveness to light variation was almost instantaneous3, most of the delay was in the computer controlling the pump and the pump actually changing the flow rate. By reducing the loop time in the reaction control script to the pump response time, an update rate of less than a second was achieved. After this correction, a good stability in the reaction conversion was obtained even for large and fast variation to the external irradiance. Up to this point, we had been using a PC to interface with a voltmeter to read the voltage drop and to change the pump flow rate accordingly. The system was fine for lab development, but clearly, we could not propose to use it as such to control multiple reactors in a hypothetic solar mini-plant. The advantages of switching from a reaction analysis approach to monitor the reaction progress to a physical measurement that directly addresses the source of variability and that can predict the reaction outcome represented a significant conceptual difference. We went back to the drawing board and decided to simplify the overall system with the adoption of an Arduino microcontroller. Once programmed with the kinetic investigation data, the controller would automatically send commands to the syringe pump to correct the flow rate based on the voltage measured in the light sensor. In this way, both the multimeter and the PC are replaced by an inexpensive integrated circuit. Tim particularly liked the inexpensive nature of this solution, whose total cost was about 50€. Actually, by using a generic Arduino instead of a genuine one or by including all the components in a single printed circuit board, the price of the system could be decreased to less than 10€ per piece (and even further in case of mass production). We believe that this system has potential to be applied for the reaction control of every solar photoreactor tested outdoors. To describe it with the words of another anonymous reviewer: “The potential of this to thus be completely automated will bring legitimacy to the idea of actually using solar to perform synthetic organic chemistry in practice”. And that is exactly the goal we are working towards! 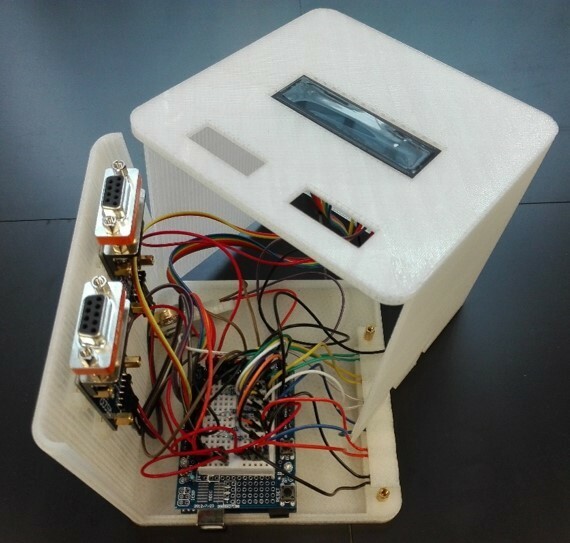 Figure 5 The 3D-printed box with the Arduino microcontroller that we used for the experiments. It is possible to connect up to 6 phototransistors (bottom right) and two between pumps and mass flow controller (serial connections, on top). The measured voltage and status are shown in the display on top. 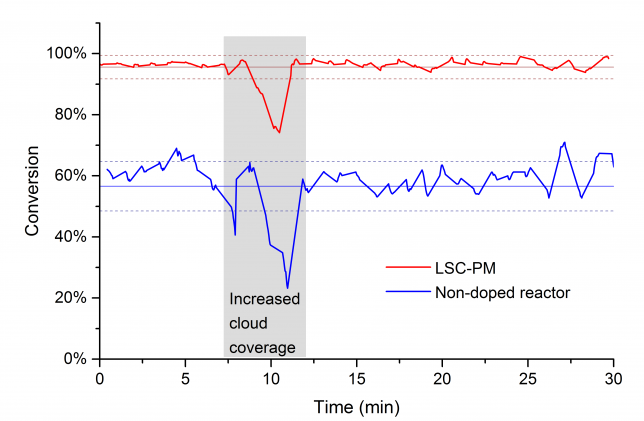 Finally, as usual in our LSC-PM papers, we tested the reaction control system outdoors on a cloudy day, luckily those cloudy days are quite common here in Eindhoven… The system worked as planned and could handle challenging weather conditions (read: frequent and steep variations due to passing clouds). Once we got these results, we went back to the office with a big smile and finalized the paper writing process. Figure 6 On the left the setup used for the outdoor experiments, the reactor on the left is connected to the light sensor while that on the right is not. 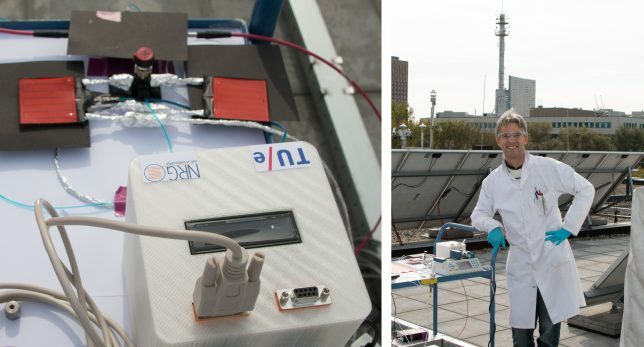 On the right, our PI Tim, checking that everything runs smoothly during our experiments on the rooftop of the Architecture Department building. 2 More details on this in the Monte Carlo ray-tracing simulations that we have published last year.